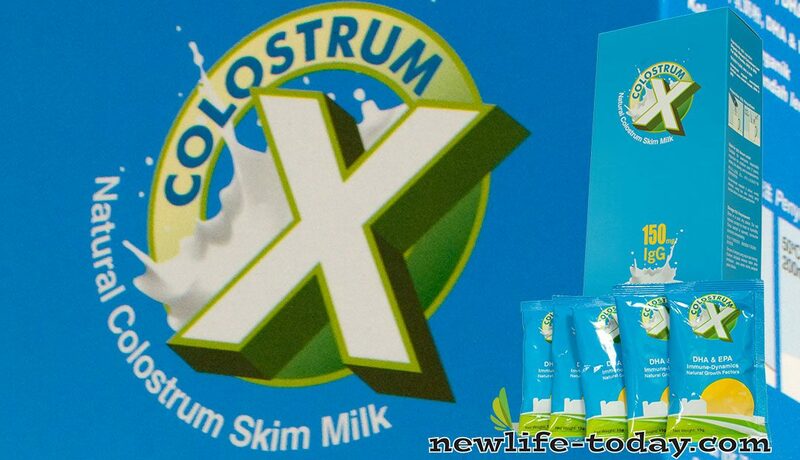 Buy this ColostrumX at RM 165.00 (20% off retail) when you become a member of NewLife International. 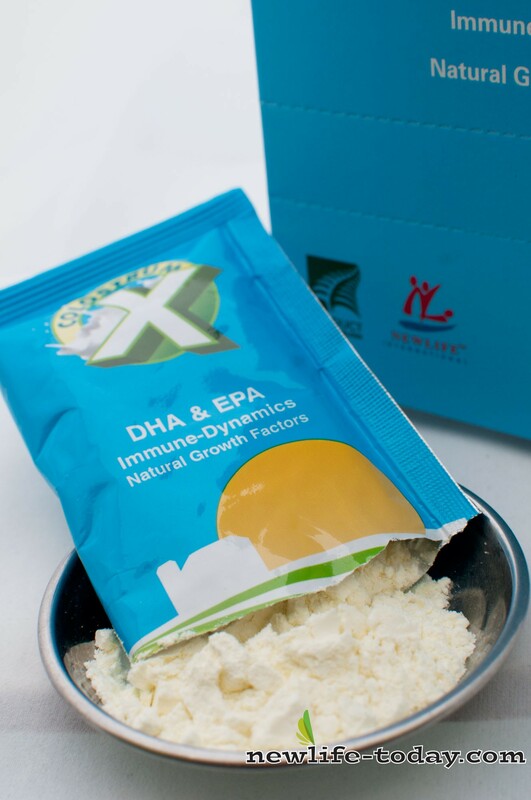 ColostrumX with DHA/EPA – Colostrum, the “first milk” produced by lactating mammals, is rich in immunity-boosting and regulating IgG-type immunoglobulins and Proline-Rich Polypeptide substances. ColostrumX is fortified with DHA/EPA, perfect for your brain and retina as a physiologically-essential nutrient required for optimal neuron function (learning ability and mental development) and visual acuity. Contains lactoferrin, an iron binding protein with therapeutic effects in HIV, candida albicans, herpes and other infections. Taken as supplement, colostrum can boost the immune system and help the body to burn fat and build lean muscle. It may also accelerate the healing of injuries, increase vitality and stamina and have an anti-aging effect. Lactoferrin, an abundant protein component of human colostrum, binds to iron. By binding to iron, lactoferrin makes iron less available for use by bacteria and other pathogenic microorganisms, including fungi and viruses, which use iron to promote their own growth. Lactoferrin’s ability to regulate iron also influences T-cell, neutrophil and monocyte proliferation, all essential components of the immune response. Iron-regulating strategies are also essential to normal growth and the control of the advancement of disease processes in the body. Colostrum, upon contact with stomach acid; inhibits attachment from, and kills campylobacter, Candida and E. coli bacteria (with colostrum leucocytes), Clostridrium, food poisoning, Helicobacter pylori, Listeria, Rotavirus, Salmonella, Shigella and streptococcus; counters leaky gut and irritable bowel syndrome, colitis, ulcers, chronic fatigue, diabetes, autoimmunity, rheumatoid arthritis, lupus and cancers; improves intestinal assimilation of nutrients, inhibits protein breakdown, shifts energy sources from carbohydrates to fats, spurs glucose transport in muscles, may inhibit scleroderma, fibromyalgia and multiple sclerosis. Phytic acid is a powerful antioxidant. Phytic acid is found in very high concentrations in colostrum. A specially formulated form of phytic acid, called Cellular Forte with IP-6 is used to treat cancers of many types. One of its major effects is to prevent iron from reaching cancer cells. Its iron binding power is so great that it is also used to treat the iron-overloaded disease, hemochromatosis. 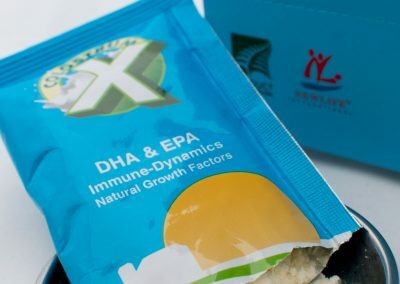 Human Growth Factors for optimum development, increased performance, and hormonal regulation. Insulin-like Growth Factors for blood sugar lowering and regulation. Epithelial &amp; Fibroblast Growth Factors for enhanced regeneration of bones and muscles, and blood vessels Metabolic Factors for healthy metabolic levels. are essential fatty acids which help to maintain healthy retina and brain function, promote a healthy cardiovascular system, as well as optimize human growth and intellectual development/ maintenance during childhood and old age. 150mg IgG IgG (Immunoglobulin G) is a powerful antibody that protects the body against toxins and pathogens such as viruses, bacteria and fungi. Suitable for everyone especially important for children over 2 years, adults, the elderly, and convalescence. Store in a cool, dry place. Do not expose content to heat or humidity. Once sachet is opened, consume contents immediately. Mix 1-2 sachets of ColostrumX in 200ml of warm water below 50 Celsius. Create your own ColostrumX recipes by mixing it with fresh juices. Do not use hot water.